Beau Jardin offer 35inch,48inch,65inch long shepherd hook,This Set Includes 2 Units of 65 Inches Long, 7 Inches Wide H Shape and 0.5 Inches Thick Shepherd Hooks. OPERATION INSTRUCTION: First dig a hole in the ground.Put some rocks on the bottom can make the whole set even more stabel,even the softer ground can be firmly fixed Do not hit the hook directly with tools to make it into the ground. 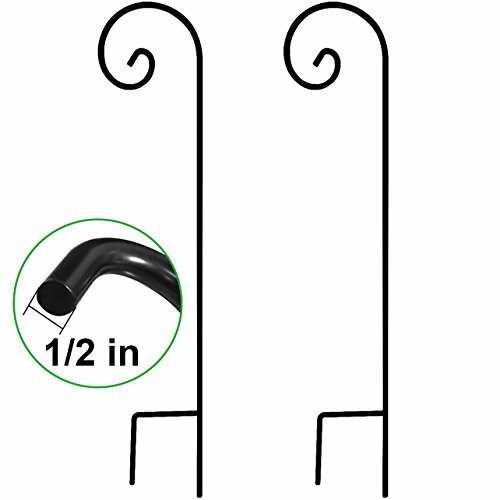 DURABLE AND HIGH : The double black heavy duty garden shepherds hook with a 65 inch tall and a 1/2 inch diameter one piece wrought iron metal garden hanging hooks, much thicker than other brand 1/4 inch garden shepherds hooks, makes you have the confidence you have the strongest and most thick garden shepherd hook for hanging bird feeder pole or garden plant stakes, just bring your heaviest flower pot basket or bird feeders pole. ANTI-RUST : This shepherds hook 65 inch will came ready to use and there no plastics or complex assembly involved, simply stake the shepherd hook in the ground with your foot and you are ready to go. These double shepherds hook glossy paint rust and the black color remains lovely. Stake the tall shepherds hook directly into the ground for a humming bird feeder pole stand hanging solar lantern, and begin enjoying a beautiful garden immediately.